Both 350Z & 370Z cars can be a lot of fun on the track. Basic upgrades like an oil cooler, brake pads, good tires. For the 370Z there are also fuel starvation problems that can be fixed pretty easily with this http://cj-motorsports.com/products/c...race-pump-370z. An oil pan extender helps too. Both are a heavy pig compared to a 240sx. The 350Z can be picked up for a reasonable price no a days. For the 350Z get the HR or VHR, the DE motors had some reliability problems when run on a track. The 370Z has improved suspension geometry over the 350Z. But the 370Z VVEL heads have their problems too. Most race teams run a 370Z block with 350Z VHR heads for the best setup. I have built cages in stripped track cars for both chassis & I prefer the 370Z over the 350Z. That CJM setup is highway robbery for what it is. I know it's not easy to develop and manufacture low volume parts, but I think he either made poor design decisions if that represents a true cost of an intank surge tank, or something else is off. Honestly, I'd try to get a Hydramat working with an intank pump and ditching the stock bucket before going with a $1100+ surge tank that by all accounts, still has issues down around 3/8 of a tank. That might run you $250-400 plus some fab work, expensive but somewhat doable. 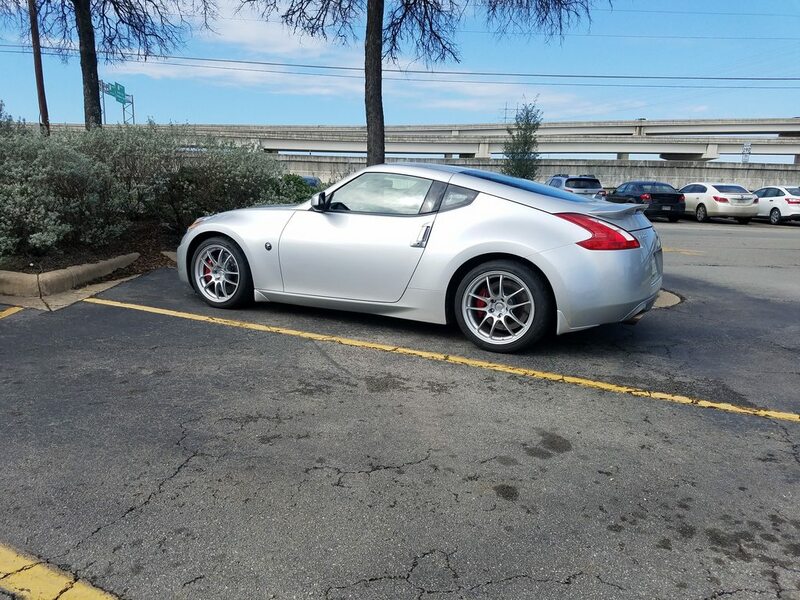 Never heard of issues with the 370Z VVEL heads, and I know a few guys who have probably 70 or 80 weekends on them by now. The engines seem pretty bulletproof as long as you keep them cool (GReddy oil pan and oil cooler does the trick). The cats will get beat up over time, all the guys had issues after maybe 30-40 weekends. The 2nd set seems reliable from what I've heard. They do tend to freak out with sticky tires in braking zones. Occasionally it can kick into an "ice mode" program and take away a lot of braking force. I don't think they tend to do it with street tires tho'. Thanks for the info guys, it supports a lot of what I've read so far. I don't plan on boosting the DE. The owner has actually done a decent bit of bolt-ons so far (Motordyne spacer and MREV lower, Nismo S-Tune catback, and JWT Popcharger). What I really like though is that he already addressed some of the weak points that come with the chassis aging as well as adding more power and asking more of the car; it already has a Z1 urethane transmission mount and Whiteline diff bushings. The suspension has been worked on as well but appears to be all done with quality parts. Honestly, the car looks perfect for what I'm looking for. Hopefully I'll be able to share it with you all soon! Last edited by Apex Eight; 08-06-2016, 09:02 AM. Are standard DEs underpowered? I didn't realize they dyno so low. VQ35DE were rated at 287HP to the crank. With a 20% drive train loss that puts it at 229.6 HP at the wheels. Most dynos I've seen hit right around there. Yeah I guess I was just a little concerned because I've seen some torque figures in around 200-10 and some even below 200. But hey, dynos and conditions vary so there will always be differences. The early DEs were rated at 274 ft-lbs, so I'd expect to see somewhere around 220-230 ft-lbs to the wheels give or take. They seem to dyno around 230-240 rwhp on a Dynojet. Somewhat unrelated, but do you guys have any tips for financing a 12 year old car? I have good credit, and an appropriate amount of income to buy the car, it's just the book value of this car is much lower than it's street value. He's done a fair bit of work to the car which raises it's street value, but they don't look at that when determining how much to lend you. I'm considering a personal loan but it looks like APRs would be through the roof. Any advice? borrow what it's worth and make up the rest in a down payment. If you can't afford that, then frankly you shouldn't be buying the car, even if you have 'appropriate amount of income'. If you don't have the money today, start putting a couple hundred bucks a month in the bank like it's a car payment. then when the next good deal comes along, you'll have a nice down payment ready to go. I started doing that about 10 years ago.. I just put money away each month and drove a beater until the right deal stumbled along. Wound up buying my G35 with cash. a few years later, I bought my F250 towbeast with cash. I'm not sure how to go about this though. The seller is asking $12,900, so I requested 13,500 to cover tax and got preapproved, then rejected. How do I know how much to ask for? I'm looking at the NADA value at it says $10,150 for "Clean Retail". I guess I'll save up a few grand and try to request ~$10K. I just really hope the car is still around then. You shouldn't have to pay tax from a private seller- at least not until you register/buy tags. every state is different here. However, if NADA value is 10,150, you're going to have a hard time borrowing more than about 9 for the car since the bank expects you to bring something to the table as a down payment. otherwise you get stuck with a high risk (and thus high interest) loan since nobody wants to loan $13k for a car they can only realistically sell for $10k. it's a losing situation for a bank to loan more for a car than it's worth. I just financed 100% (including TTL and an extended warranty) on my E70 (purchase price a little over $20k). I've got good credit, and it was near free money at the low interest rate, so why not. This is through a local credit union, I found they give way better terms than big banks. I will die escaping. I will die returning to the fold.